Okay, announcement. I'm about 3/4 through this book and I'm absolutely in love with it. For the first few pages I thought, "Oh, great. Another book that mimics a southern accent … How tedious" Not long after that I fell down the rabbit hole of bibliolust. Readers, I am in love. The words "emotional rollercoaster" are so over-used, so instead I'll assert the emotions cover the full gamut. I care about these characters. In fact, I love them. They're so faulty, so full of good, but also, often fall short of what general morality dictates they should do. Olivia Harker is her father's daughter. He is a dreamer, and someone who cares for animals so deeply he becomes an amateur vet, setting up his own animal hospital in their basement. Olivia travels everywhere with him, helping him aid animals in giving birth, etc. Her mother, having gone into an asylum shortly after Olivia's birth, is vicious and horrible to her daughter when she comes home. As the years go by, that gets worse and worse. The older Olivia falls in love with a local boy, but when his parents die within a short time he turns his face to the wall and buries himself in his sorrow. Much later, a local hunter, with a huge grudge against Olivia's family, begins killing wolves for sport on the edge of her family's land. By this time she's kicked her mother out of the house, and cares for her grandson, Will'm. There's just so much more to it. This barely scratches the surface. I can't stand to think of spoiling it for any potential reader. 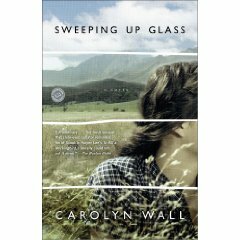 It's simply amazed me how Wall's able to create such an intricate story in such a short space, and how she pulls the reader from emotion to emotion. Despite the fact we want to yell at her main character sometimes, we know she's doing all she can with what she has. Which isn't much. The book will be released in August. If you trot over to Amazon you'll see only a couple advance reviews, but they're glowing. This is my pre-review review. My notice that if you can get your hands on a copy of this book then DO! Maybe I can get another for a giveaway. We'll see. But, in any event, I give this one my highest recommendation. Be on the lookout. I’ve just finished it, and it is wonderful!